Where are these cake domes typically used? Bake shops and catering companies like to use these cake plates with domes to keep desserts and other food items fresh. Restaurants also tend to use these cake domes a buffet table. There are several shapes and sizes available to choose from here. In addition to the large selection of cake domes, there are also several cake plates, and dessert trays for sale. The cake pedestals shown here are a perfect complement to any cake or dessert display. These clear dessert containers & domes help to keep germs, and other contaminants away from the items on display. Bakeries like to use these containers in lieu of glass covers that are more prone to break, and generally more expensive. More and more individual buyers are purchasing cake plates with dome covers to use as food containers at a picnic or large gathering. Food covers are available in many different shapes and sizes. Use these cake dome products to keep desserts stable while transporting or carrying them to an event. Some of the covers featured here have hinged lids to allow for access to the desserts being offered. Bakeries and other food service businesses benefit from being able to quickly access items stored in hinged containers. Easy access to the cupcakes, donuts or other food items without having to lift the entire lid from the plate helps save time and effort. In addition to the cake domes for sale here, there is also an impressive selection of cake pedestals and cake stands. These cake pedestals are an ideal means of displaying cupcakes or other desserts. These cake stands are made of black plastic, and feature gold metallic banding along the base for an elegant accent. Why have a stunning cake just sitting on a table, when it can be elevated with a beautiful cake pedestal like the items offered here? Some of these cake stands also come with an included clear cover. 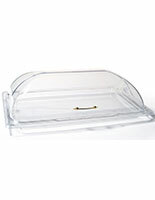 What's great about these trays is that they can be used both with or without domes.We offer many of these parts separately to give customers freedom when arranging food displays. There are also plates and covers sold as sets ensuring a perfect match. These cake dome sets are made of clear plastic as to not distract from the cupcakes or other pastries on display. Some of the containers feature a chrome handle. The handle adds both an elegant touch, and an easier means of lifting the cover. Other cake covers feature a hinged lid for easier access. These containers are very useful for both restaurants, and individuals for keeping desserts and other sweet treats free from bugs, or airborne germs. As with most of the cake domes and cake plates offered here, all of the components of the sets can be used individually as well. It's like getting two products for the price of one! For bakeries and restaurants that also use trays to display or serve desserts on; there are several sizes to choose from here. 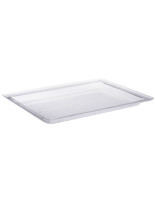 These trays are clear plastic serving trays suitable for displaying cupcakes or cookies. These rectangular platters feature a raised lip around the outer edge to help minimize the contents from sliding around the tray. 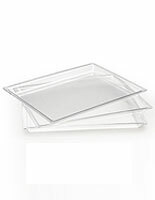 There are three sizes of these rectangle trays offered, all sold at discount prices. Additionally, there are round serving plates that are commonly used by bake shops and restaurants to showcase a featured food item. 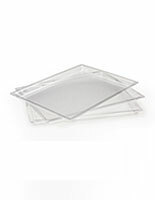 These round trays work well with many of the dome covers offered here. No matter what the need, there is sure to be a cake cover and plate here to satisfy the need. In addition to the huge selection of cake pedestals, and cake stands sold here; there is also a large assortment of food display items. Bakeries and caterers like to display their food items, and desserts to lure customers into buying them. Many of these food display cases are made from clear acrylic so that the case doesn't obscure the view of the displayed contents. Are these plastic cake plates dishwasher safe? Most of the stands sold here are hand wash only. Dishwashers tend to be too hot for these plastic plates, potentially melting them. The heat and hot water from a dishwasher also degrades the plastic over time. What are the advantages of using these plastic cake stands vs. glass stands? Glass cake pedestals have a greater potential of breaking if dropped. Glass cake plates are typically more expensive than plastic covers. Glass cake covers are far more heavy, making them more difficult to carry and transport. Displays2go has been in the business for over 40 years. What started out as a side job making small acrylic displays for local banks, has now turned into one of the largest display products supplier in the country. Orders can be placed online 24/7 via this secure website. There is also a large call center full of knowledgeable staff members that can process orders, and answering any shipping or product questions that may arise. As another alternative, there is also live chat available during normal business hours for quick instant answers to product questions. New products are added to this site daily, so be sure to bookmark this website, and check back frequently to see all of the new and exciting merchandise that has been added. Expedited shipping is available on the majority of the products offered here. In addition; orders that are received prior to 3PM EST, ship the same day. Orders received past the cutoff time, are shipped the following business day!